The business side of President Trump's Unified Tax Plan, which includes cutting the corporate tax rate, could push GDP by 5 percent in the next 10 years, according to Council of Economic Advisers chairman Kevin Hassett. The council just released a new paper, which looks at how wages are affected by overall growth in the economy using three types of economic models. The paper looked specifically at the effects of cutting the corporate tax rate from 35 to 20 percent and immediate full expensing of nonstructure investments. The report found that cutting the corporate tax rate could lift gross domestic product by a range of 3 to 5 percent over the long run. The study notes that GDP could grow even further due to the plan's individual income tax reforms and reforms to pass-through business taxes, but these were not modeled in the report. "We can be highly confident that the level of GDP will be 5 percent higher 10 years from now," Hassett said. "We would ramp up to that with steady growth of about 0.5 percent per year higher just from the corporate tax side. So obviously the president's plan is already having a positive effect on economic growth." In addition, the study projects that wage and salary income could increase by roughly $4,000, due to the business side of the plan. Reforms to the individual income tax could increase this number even further. 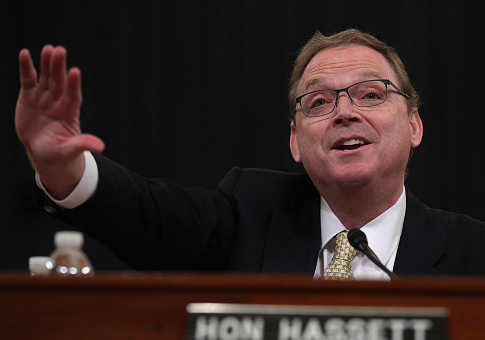 "We find a very strong agreement across the different classes of models that the average American household yearly earning will conservatively go up by about $4,000 if the corporate side of this proposal becomes law," Hassett explained. "Once it hits that $4,000 it will continue to provide yearly increases from there and wages and incomes would grow." Hassett says this is an urgent issue since there has been a disconnect between what happens to America's firms and their profits and what happens to America's workers. "While profits have been soaring, their wages have been not," Hassett said. "Now one of the reasons wages might not go up that economists can tell you is that workers are not getting enough capital to provide them with productivity over time." "Ever since the Second World War, capital deepening provided almost a percent a year on productivity growth and wage growth," he said. "But capital deepening and the amount of purchases on machines that firms do to give workers more stuff to work with declined so much in the second half of the Obama administration that it went negative in a sustained way." Hassett says that a solution to this problem is fixing the tax code. "Right now we've got a corporate tax code that rewards firms for locating their capital overseas and not putting their factories here. So that's exactly what President Trump wants to do." "Our report is only studying the corporate side of it, but the corporate side of it will lure capital back to the U.S., increase the amount of capital being paid there to support wage growth and move wages back to about $4,000 higher than baseline," Hassett said.